Botany: Bibhītaka is a large deciduous tree with a buttressed trunk, thick brownish-grey bark with shallow longitudinal fissures, attaining a height of between 20 and 30 meters. The leaves are crowded around the ends of the branches, alternately arranged, margins entire, elliptic to elliptic-obovate, rounded tip or subacute, midrib prominent, pubescent when young and becoming glabrous with maturity. The flowers are pale greenish yellow with an offensive odor, borne in axillary spikes longer than the petioles but shorter than the leaves. The fruits are ovoid drupes, grey in color, obscurely five-angled when dry, containing a kernel within. 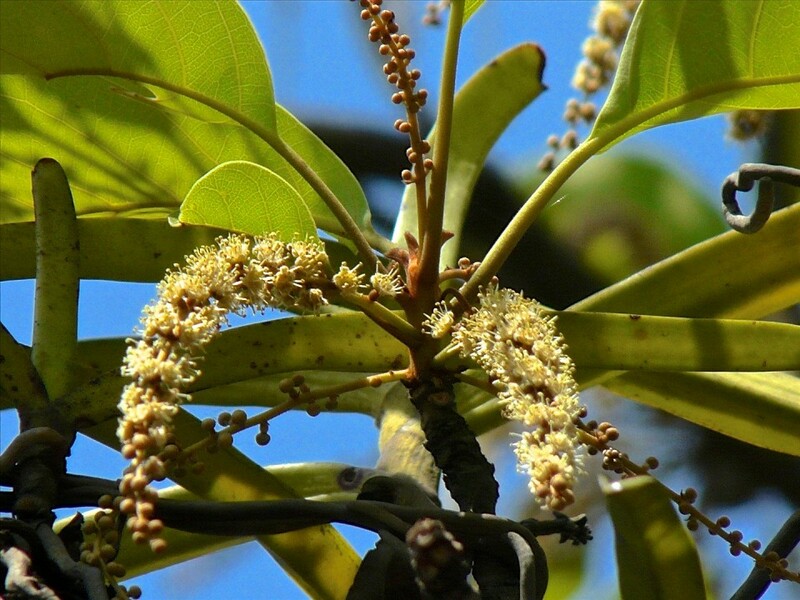 Bibhītaka is found growing wild throughout the Indian subcontinent, Sri Lanka and SE Asia, up to 1200 meters in elevation, in a wide variety of ecologies. Bibhītaka is also commonly cultivated, planted along roadsides in large cities (Kirtikar & Basu 1935, Warrier et al 1996). • Prabhāva: Bibhītaka is called ‘intimidating’ because disease shrinks in the face of its power to heal. Its synonym Akṣa (eye) indicates Bibhītaka’s utility in diseases of the eye (Dash 1991, Nadkarni 1954, Srikanthamurthy 2001, Warrier et al 1996). Constituents: Bibhītaka contains several triterpenoids including belleric acid, b-sitosterol, and the saponin glycosides bellericoside and bellericanin. Other constituents include polyphenols (gallic acid, ellagic acid, phyllembin, ethyl galate, and chebulagic acid), lignans (termilignan, thannilignan, hydroxy-3′,4′-[methylenedioxy] flavan, anolignan B), and a fixed yellow oil (Kapoor 1990, Nandy et al 1989, Row & Murthy 1970, Valsaraj et al 1997). Indications: Dyspepsia, flatulence, hemorrhoids, constipation (unripe fruit), chronic diarrhea and dysentery (dry fruit), hepatosplenomegaly, intestinal parasites, cholelithiasis, fever, sore throat, pharyngitis, laryngitis, cough, catarrh, bronchitis, asthma, skin diseases, edema, ophthalmia, alopecia and premature graying, headache. Contraindications: vātakopa (Frawley & Lad 1986, 164). Medicinal uses: Bibhītaka is a celebrated constituent of Triphalā, along with Harītakī and Āmalakī, stated specifically to be a rasāyana for kapha, useful for reducing excess medas (Dash and Junius 1983, Frawley & Lad 1986). It is a stimulating astringent, and has wide application in any condition of marked by atony, prolapse, catarrh or hemorrhage, useful in the treatment conditions such as uterine prolapse and menorrhagia. The mature, dried fruit of Bibhītaka is effective in the treatment of dysentery and intestinal parasites but should be taken along with purgatives such as Markandika to counteract its constipating effects; the sun-dried unripe fruit,, however, is gently aperient and can be used on its own. Dash and Junius state that Bibhītaka is a good remedy in for vomiting in pregnancy (1983). Frawley & Lad mention that Bibhītaka is a useful antilithic in gall bladder and urinary diseases, liquefying and expelling the stones (1986). The Cakradatta states that the fruit pulp mixed with ghṛta is covered with cow dung and heated in a fire, and held in the mouth to control coughing (Sharma 2002). For severe cough and asthma the cūrṇa of the dried fruit may be taken with honey (Sharma 2002). Mixed with saindhava, Pippalī and buttermilk, Bibhītaka is taken in hoarseness (Sharma 2002). A decoction of the dried fruit may be taken internally and externally as an eyewash in the treatment of ophthalmological disorders (Nadkarni 1954). Vaidya Mana Bhajracharya indicates that the fresh fruit pulp is used as a collyrium in the treatment of nontraumatic corneal ulcer (1997). Warrier et al mentions that the oil from the seeds is trichogenous, and can be used topically for leucoderma and skin diseases (1996). The kernel is typically removed before Bibhītaka is used, and specifically stated to be madakārī (‘narcotic’), used topically as an analgesic in the treatment of inflammation and pain, and internally in vomiting, bronchitis and colic (Dash and Junius 1983, Kirtikar & Basu 1935). In ancient India Bibhītaka fruits were used as a form of dice (Sharma 1993). • Cūrṇa: 2-5 g b.i.d.-t.i.d. • Kvātha: 30-60 mL b.i.d.-t.i.d. • Tincture: crushed dried fruit, 1:4, 50%; 1-3 mL b.i.d.-t.i.d.